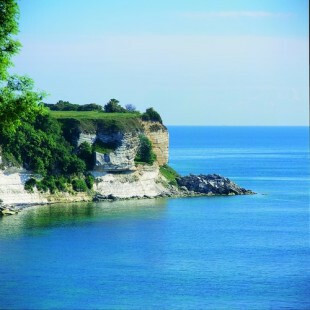 Stevns Klint in South Sealand is a geological site which comprising of a 15 km-long fossil-rich coastal cliff, offering exceptional evidence of the impact of the Chicxulub meteorite that crashed into the planet at the end of the Cretaceous, about 65 millions years ago. Researchers think that this caused the most remarkable mass extinction ever, responsible for the disappearance of over 50% of all life on Earth. The site harbors a record of the cloud of ash formed by the impact of the meteorite – the exact site of the impact being at the bottom of the ocean off the coast of Mexico’s Yucatán peninsula. An exceptional fossil record is visible at the site, showing the complete succession of fauna and micro-fauna charting the recovery after the mass extinction. The Danish Wadden Sea is an extension of the Dutch and German Wadden Sea site, inscribed on the World Heritage List in 2009. The Wadden Sea is the largest unbroken system of intertidal sand and mud flats in the world. The complete extension now covers most of the Danish Wadden Sea maritime conservation area, as well as a maritime extension of the Dutch Wadden Sea Conservation Area and the German Wadden Sea National Parks of Lower Saxony and Schleswig-Holstein. Denmark now has five unique World Heritage Sites, namely: Kronborg Castle, Stevns Klint, Roskilde Cathedral, he historic rune stones Jelling and The Wadden Sea National Park.